Most mortgages in the industry are considered conforming loans, which is to say that these loans conform to federal guidelines. In general, conforming mortgages only include home loans that are valued at up to $417,000 (however, in some states, conforming loans can be up to $636,150). Conforming loans fall under government sponsored enterprise guidelines that are created by Fannie Mae and Freddie Mac — two government enterprises which back the mortgage market by buying conforming loans. 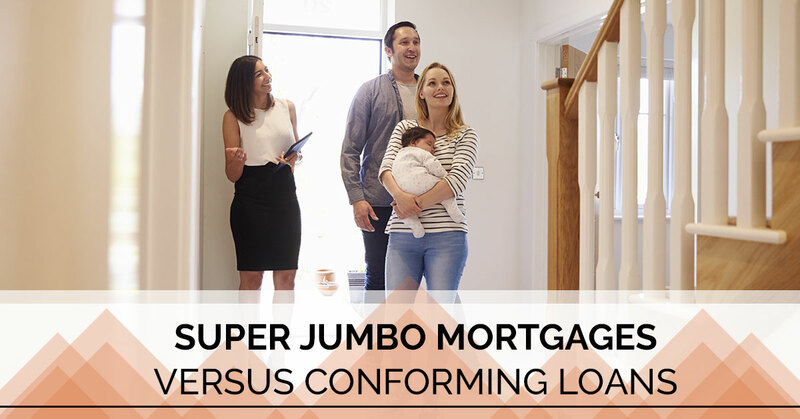 Now you may be asking yourself, what’s the difference between super jumbo mortgages and traditional conforming loans? Well, we have the answer so that you can better understand what super jumbo mortgages are, and how mortgage lenders determine the rates that they offer for their super jumbo loans. Now, super jumbo mortgages are non-conforming loans, because they exceed the limits put forth by Fannie Mae and Freddie Mac. As such, these loans can be more difficult to sell from lender to lender, and they’re considered riskier loans for the lenders that create them. Since these loans are riskier, they have higher interest rates than conforming loans on the market. That was especially true after the housing bubble and collapse of the 2000s. However, super jumbo loans have stabilized, and they are gaining popularity once again. That’s good news for homebuyers. Since super jumbo loans are stable and in demand, their interest rates are decreasing. As a matter of fact, super jumbo loan rates are comparable to conforming loans, and they have rates that are usually only a fraction of a percent higher than jumbo mortgage rates. Super jumbo mortgages have higher rates than jumbo mortgages due to their size and risk, and they have higher rates than conforming loans for the same reason. However, now is the best time in the past decade to attain super jumbo mortgages, since rates are as low as ever — they’re nearly the same as jumbo mortgages and only slightly higher than conforming loan rates. Here at MortgageBase, we offer competitive super jumbo mortgage rates; our rates are nominally higher than our jumbo mortgage rates, and all of our loans are comparable to current conforming mortgage rates on the market. If you’re curious about the super jumbo mortgage rates that we offer, you can get a rate quote in seconds. Here at MortgageBase, we’re ecstatic to connect homebuyers with the home loan they need to acquire the home of their dreams. We make obtaining a loan simple. We’ll work with you to get pre-approval for your loan, and we’ll help you to, ultimately, purchase the home you desire. We specialize in creating super jumbo home loans, including interest only super jumbo mortgages; 15, 20, and 30-year fixed rate super jumbo mortgages; and super jumbo fixed term adjustable rate mortgages (ARMs). Get a quick rate quote for your home loan, and get in touch with us if you have any questions about our super jumbo mortgage products.